Below are some of the nearest Courses to Praia da Luz, however there are at least a dozen more within an hours drive. If you are visiting the Algarve from the U.K, I strongly recommend (if possible) you book your golf before you travel as it can save you a considerable amount of money. 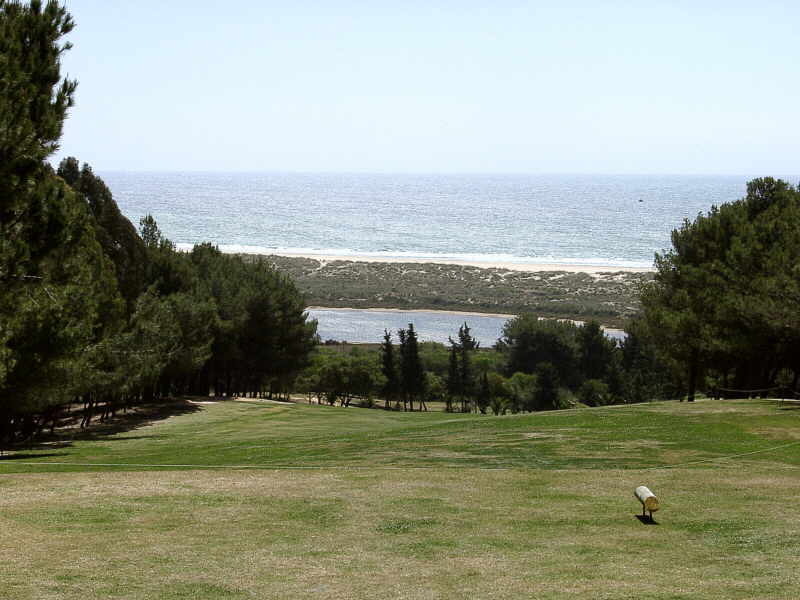 Adding a member to our group at the Palmares course was £15.00 over the pre booked UK price. 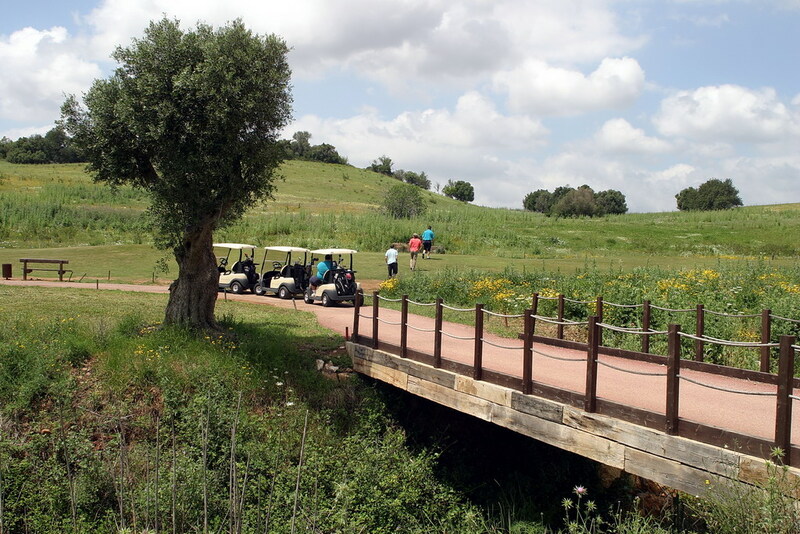 Buggies whilst recommended for the hilly courses like Palmares, Gramacho and Parque are pretty pricey (£25 - £35) and can be in short supply during the high season. Also if you are only playing occasional rounds, you might want to consider hiring your clubs at the courses, prices start around £15.00 a round for quality sets. If you offset that against the hassle of carrying your own through the airports and paying the £30 excess baggage it might make sense. Use the button at the foot of each of the Course detail sections to show the Score Card. Positions on the map are approximate ( and show the town location only ). Click on an index letter ( A: ) to jump to the location on the map and brief details of the course. Click on a course name ( Morgado ) for full details. Address: Apartado 293, 8501-902 Portimao. Telephone: (+351) 282 402 150. Address: Caixa Postal 1, Alvor, 8500 Portimão. Telephone: (+351) 282 416 913. Address: Quinta da Boavista SA. Apartado 62 8601-901. Lagos. Telephone: (+351) 282 000 111. Fax: (+351) 282 782 150. Address: Quinta do Gramacho, 8400 Lagoa. Telephone: (+351) 282 340 900. Address: Budens - 8650 Vila do Bispo. Address: Eurogolfe, SA Vila Fria 8300-Silves. 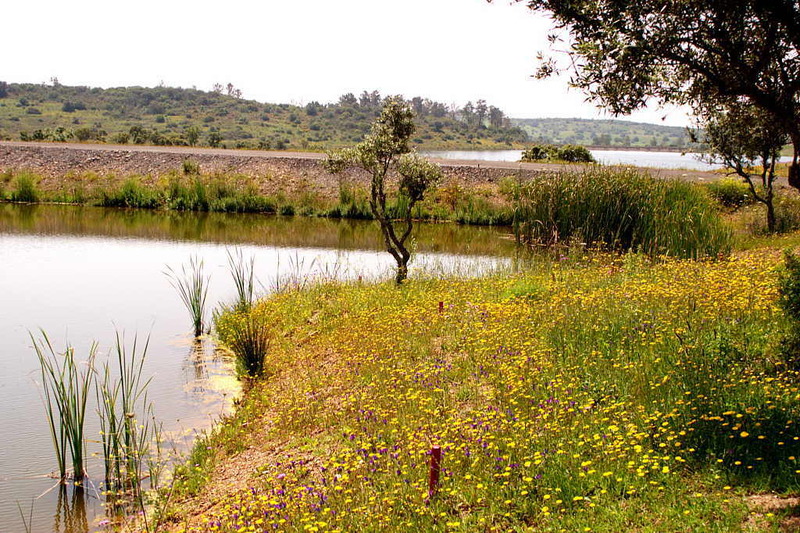 This is the second course to be developed at Morgados do Reguengo, just north of Portimao. 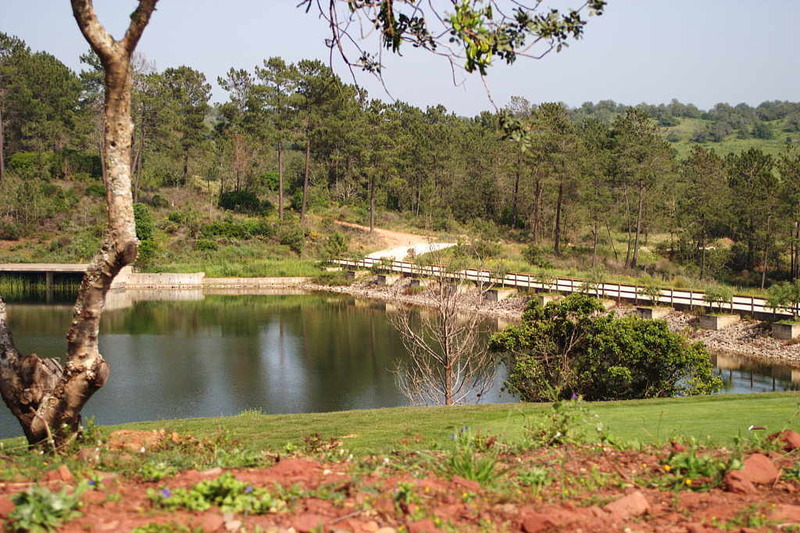 This new course (2006) is a complimentary course to Golfe do Morgado right next door. At 6200 yards, par 71 it is a shade shorter than the Morgado course. 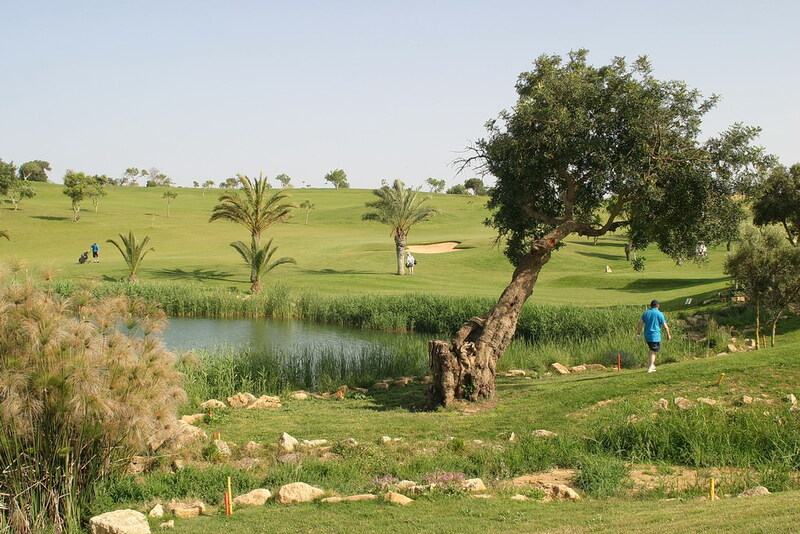 With quite a varied landscape, including lots of meadow type flowers, the course runs next to two large lakes, through wide valleys with superb views of the Monchique mountain range to the north. The course has a couple of handy toilet 'blocks', one halfway out the other halfway in. The large clubhouse (shared with the Morgado course) affords an excellent ‘gallery’ view of the Morgado course / eighteenth. A nice bar that does light meals and snacks, combined with an extremely smart restaurant. Facilities include chipping and putting greens, club hire, trolleys and buggies. 2007 Update: The fairways have now been completely landscaped and have grown in nicely, a tremendous improvement for playability as well as visually. The greens are to an exceptional standard and boy are they fast. It will require a good eye to read the lie as they are rarely flat and a putt to the flag could take you much further away if you are not careful. This is becoming a favourite. Directions: Take the road to the north from Portimão in the direction of Monchique and Silves and under the A22 Motorway. 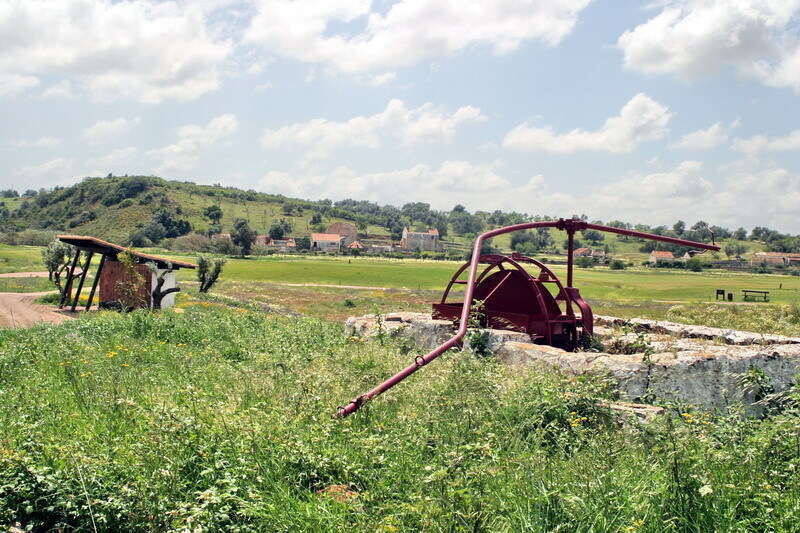 From the access roundabout of the A22 follow the signs to Monchique and Silves. After 1.1 kms take the signposted left turn and drive a couple of hundred metres where you take the right turn into the Morgado Estate. Follow the track to the Club House. This new and shorter route from the Portimão-Monchique road to the Clubhouse and facilities knocks about 10 minutes off of the original routing, which was a couple of km's further on. (April 2006). Architect : Russell Talley (European Golf Design). Grass: Greens : Penn A4, Fairways: Tifton 419. Nº of Holes : 18, Par : 71. Length (metres) : Whites - 5641, Yellow - 5055, Red - 4291. Facilities : Driving Range, Putting Green, Pitching Area (with bunkers), Trolleys, Club Hire, Pro-shop. Eating : Restaurant and Bar at the Club House (shared with the Morgado course). HOLE METRES PAR STR. HOLE METRES PAR STR. Situated near the town of Alvor, 45 minutes drive from Faro, 20 minutes drive from Lagos toward Faro. This was the last course designed by the legendary Sir Henry Cotton, the triple winner of the British Open. It embodies his belief that a golf course should test players with low handicaps, but also provides a pleasant game for golfers of only average level. The course, with the beautiful Monchique mountains as its back-drop, runs through two valleys and offers winding fairways and gently undulating greens. Make sure you play a good 18th hole as it leads up to a basin right in front of the lovely (new 2003) club house that adds the finishing touch to a course that must be on your list to play in the Algarve. Directions: Turn off the EN 125 towards Alvor. On the Portimão - Alvor road, turn right at the turn for Praia de Rocha. The course continues to be well kept as you would expect and there is rumour of another 9 holes being added in the near future. Green Keeper: Engº Luís Carrilho. Pro's: Tony Bennet & BGLC Learning Centre. Architect:Sir Henry Cotton and Peter Dobereiner. Grass: Greens: Penn Links, Fairways: Bermuda. Nº of Holes: 18, Par: 72. Facilities: Driving Range, Putting Green, Pro Shop. Eating: Restaurant and Bar at the Club House. 3 kilometres (2 miles) north west of Luz. This course is set in a beautiful location on a headland between Lagos and Praia da Luz, There are great views of the bay of Lagos, and the Monchique mountains in the distance. 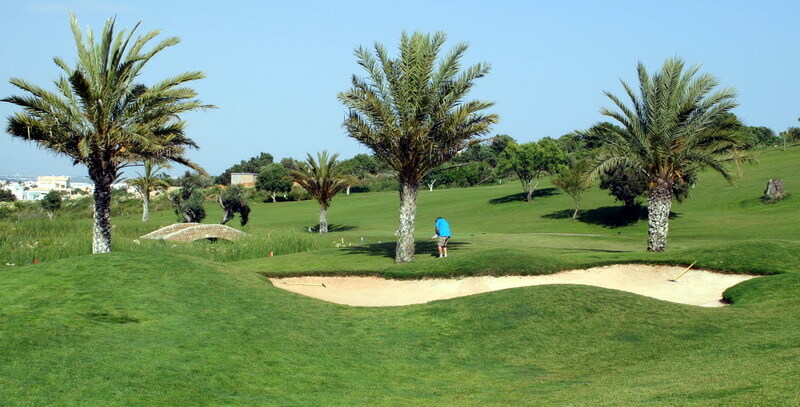 Boavista offers two distinct types of play providing a variety of attractive and interesting holes. From the first to the last putt on the 18th green it promises a sensible game for the average player. With breathtaking views, spectacular scenery and the Atlantic Ocean, which is visible from most holes, all combine to make this course a delight for the golfer. These days most of the early fairways are flanked with villas which may be disconcerting for some. Golf Services Manager, Quinta da Boavista SA. Apartado 62 8601-901. Lagos. Algarve. Portugal. Grass: Greens : Penn Links, Fairways: Bermuda..
Facilities : Driving Range, Putting Green. Directions : Take the A 22 to Lagos. The course is 4 km to the west on the Sagres road. The second Carvoeiro course, Quinta do Gramacho is a full 18 holes. Like it's sister course, Vale da Pinta, it is set in superb countryside and there are some testing holes. In particular the 7th requires two long and accurate shots to reach the green. Grass: Greens : Bent Grass, Fairways: Ray Grass + Bermuda. Nº of Holes : 18, Par : 72. Facilities : Driving Range, Putting Green, Chipping and Bunker practice area, Pro-Shop, David Leadbetter Golf Academy. Directions: Follow the EN 125 and take the turn to Carvoeiro at the Lagoa roundabout. 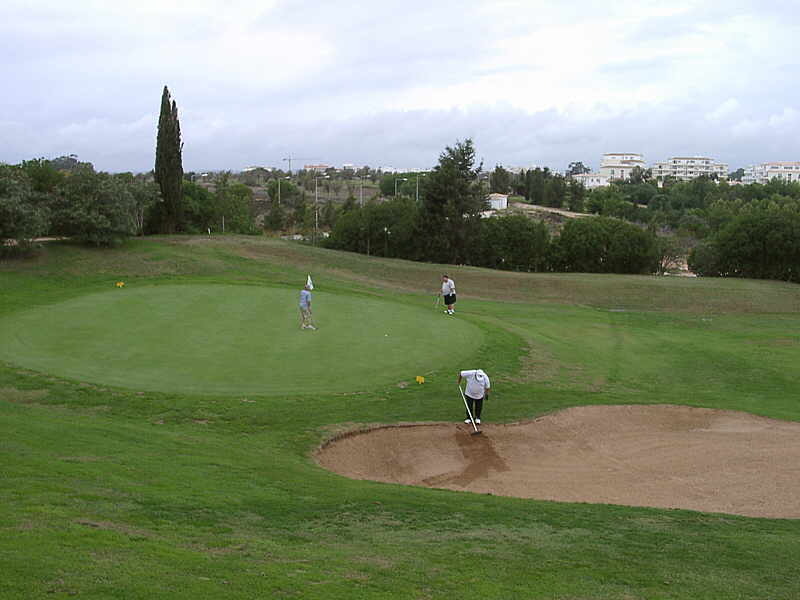 This course is one of the newer courses to open in the Algarve (2003). 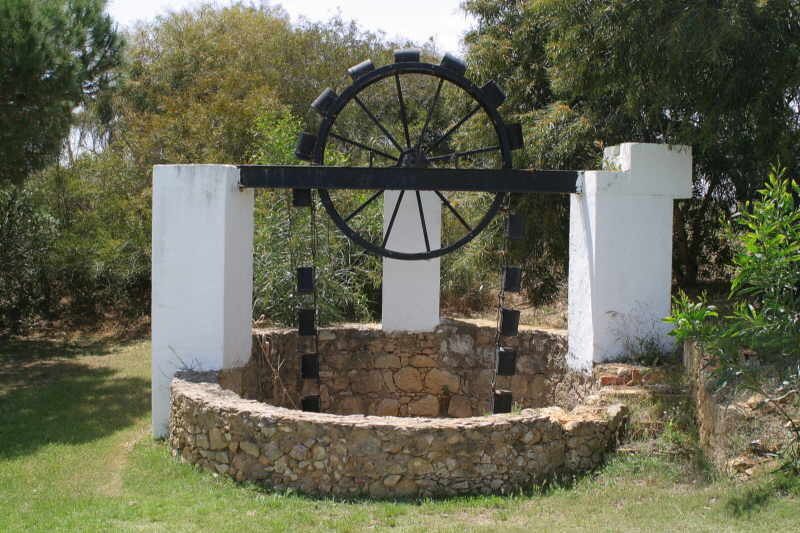 Located just to the north of Portimão (about a 30 minute drive from Luz). The course is laid out in a large 980 hectare estate in the foothills of the Monchique mountains. Quite different to most other courses on the Algarve as it is very open with wide fairways. A second course (Golfe dos Álamos) opened April 2006. It has smaller greens than the Morgado course which will place a premium on accurate approach shots. A new and shorter access road from the Portimão-Monchique road to the Clubhouse and facilities is almost complete. Facilities include a Driving Range, Putting Green, Buggies, Trolleys, Club Hire, Pro-shop, Golf Academy, Restaurant, Bar. 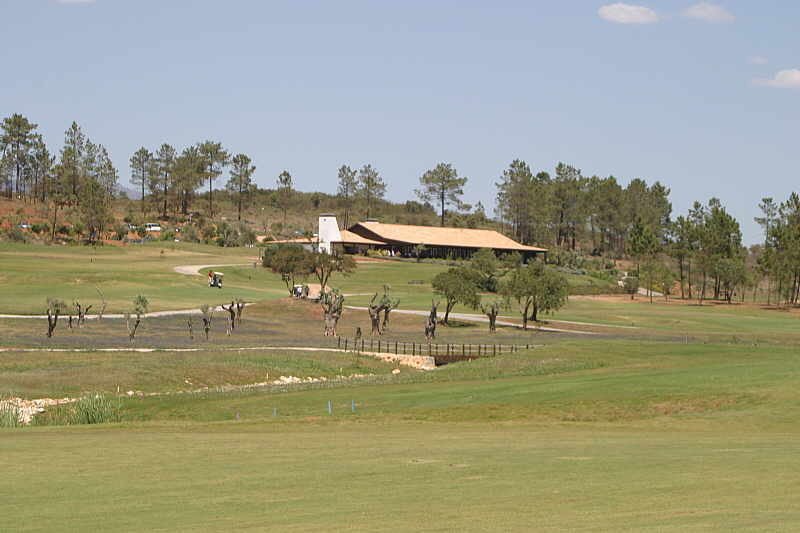 See also the new (2006) sister course Golfe dos Alamos above. Nº of Holes : 18 Par : 73. Directions: Take the road to the north from Portimão in the direction of Monchique and Silves and under the A22 Motorway. From the access roundabout of the A22 follow the signs to Monchique and Silves. After 1.1 kms take the well signposted left turn and drive a further 1.2 kms to the west where you take a right turn into the Morgado Estate. Follow the road to the Club House. A new and shorter access road from the Portimão-Monchique road to the Clubhouse and facilities is now complete (April 2007). 5 kilometres (3 miles) east of Luz. This course is laid out on the side of a south-facing hill overlooking the Bay of Lagos. 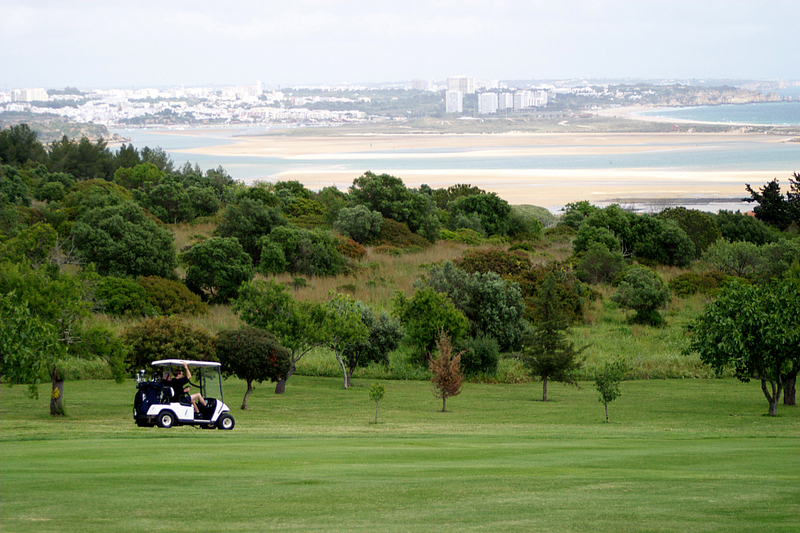 We think it is the most attractive location of all the golf courses we've visited in the Algarve. The views as you play your round are quite breathtaking (Check out the 16th). The first hole drops, some 300 plus feet, from the clubhouse down to the beach with great views toward the Cape. Five of the holes are placed on the sand dunes with the fifth, a par-5 of 550 metres making a real challenge. 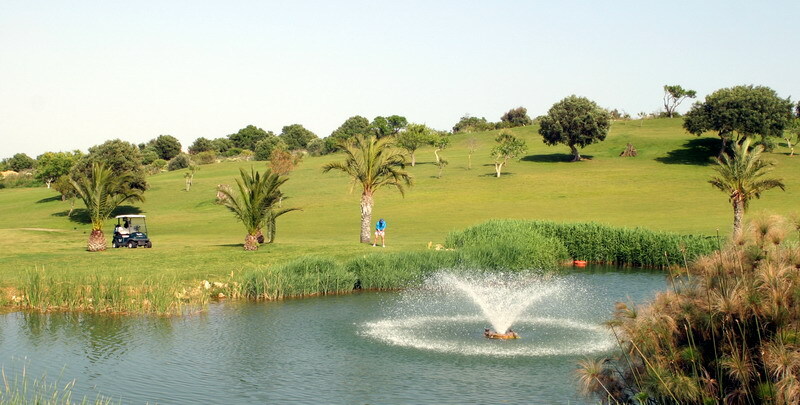 At present there are few villas clustering the fairways so the feeling of openness as you play is very refreshing. Grass: Greens : Pencross and Penn A4, Fairways: Bermuda. Facilities : Driving Range, Putting Green, Chipping Green, Pro-Shop, Golf Academy. Directions: Follow the EN 125 towards Sagres. As you approach Lagos follow the signs to Meia Praia. If you miss the small sign and arrive at a roundabout do a full circle of the roundabout and return over the bridge. Take the first turn right at the sign post to Meia Praia. Follow the signs left at the next roundabout and then forward at the following roundabout. The course is at the far end of the beach. 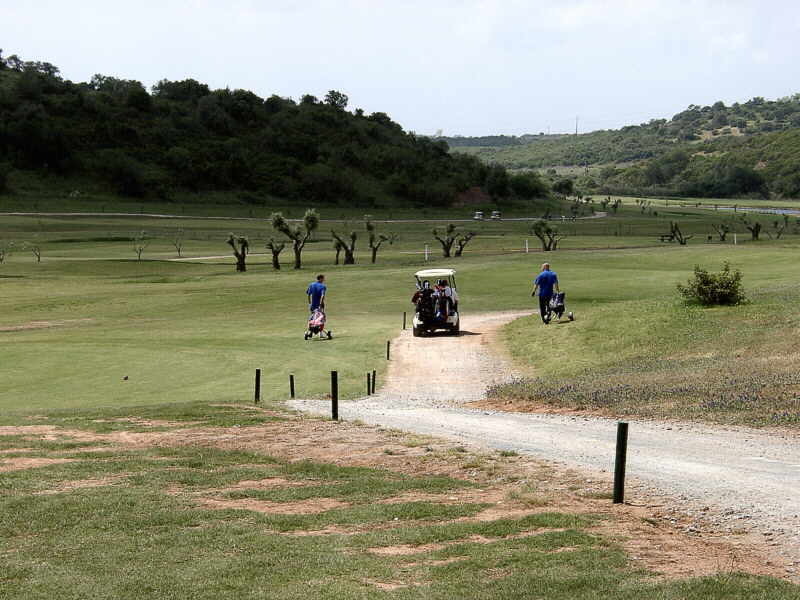 Located 15 kilometres (9.5 miles) miles west of Luz, the course is set in a hilly countryside with some dramatic holes. 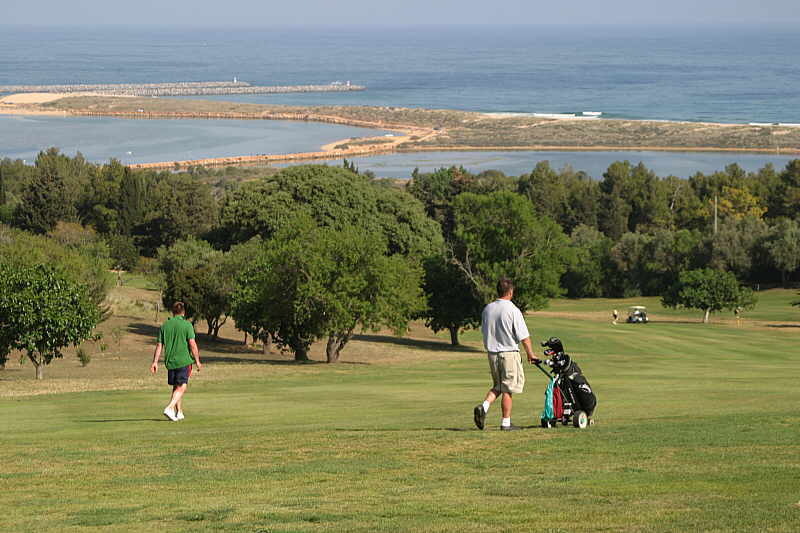 The setting of this course is in the most western part of the Algarve. The architect of this course has created a fascinating course that presents visually attractive views of the surrounding countryside lined on the horizon by the sea. The fairways roll up and down through hills and really demand accurate shots and good placing, otherwise you'll have a frustrating game. A buggy is strongly recommended unless you are super fit. Definitely not a course for the faint hearted. Course Manager : Alan Hodson. Green Keeper : Vitor Pinheiro. Grass: Greens : Bent, Fairways: Bermuda. Length (metres) : White - 5673, Yellow - 5453, Red - 4618. Facilities : Driving Range, Putting Green, Pro-Shop, Golf School. Eating : Restaurant and Bar at the Club House. Address : Budens - 8650 Vila do Bispo. (1992) Situated near Carvoeiro in an old olive grove, Vale da Pinta is a championship course that is adaptable to any kind of game. Trees over 1500 years old. Owner : Carvoeiro Golfe, SA - Address : Carvoeiro Golfe Apartado 1011 8400-908 Carvoeiro Lga. Director : José Carlos Matias. Green Keeper : Eng. Miguel Grosso. Pro's : Mark Gasper, Carlos Ribeiro. Grass: Greens : Bent, Fairways : Bermuda. Length (metres) : Black - 6115, White - 5662, Yellow - 5237, Red - 4860. Directions : Follow the EN 125 and take the turn to Carvoeiro at the Lagoa roundabout. Address : Quinta do Gramacho, 8400 Lagoa. A new course for the start of 2007. Whilst Silves is a quiet, peaceful spot, the new course is anything but the proverbial walk in the park even though it is still 'young'. Target golf is the secret to success on this course. An example being the drive at the first hole which has to negotiate two water hazards on both flanks. A confident, straight shot will benefit you with a relatively easy uphill approach shot. Silves encourages and rewards attacking play. It has a natural beauty and an elegant design. The excellent condition, pretty much all year round, is ideal for possible low scoring. For a test in precision, this course has few equals. It is 'parkland golf' at its best. Most of the holes offer spectacular mountain and valley views, overlooking palm trees and olive groves. You will find there are oranges and figs to be had along the way ( as long as you are out of sight of the course marshal ). The severity of the bunkering is enough defence against the onslaught of the games big guns. If you are lucky / unlucky the smell of the nearby cork factory occasionally pervades the normally clean air. The clubhouse is quite spartan, though it has a nice terrace and produces light snacks to full meals and has an adequate bar. Apparently it will eventually be replaced by a new lavish affair sometime in the distant future. This course is definitely one to book in advance as on-course prices are €80 a round whilst booking from the U.K. reduced this to €50! Grass: Greens : Penn A4, Fairways: Lolium Perenne. Nº of Holes : 18, Par : 70. Length (metres) : Whites - 5615, Yellow - 5256, Red - 4728. Course Rating : Men White - 68,8, Men Yellow - 67, Ladies Blue - 72,7, Ladies Red - 69,1. Slope Rating : Men White - 121, Men Yellow - 119, Ladies Blue - 125. Facilities : Pro-Shop, Golf Academy, Driving Range, Putting Green. Drive west along the A22 ( Via Infante ) motorway and turn off at Lagoa and bear right towards Silves. At the next roundabout bear right and then left back under the motorway - signs "Golf" indicate the direction. Immediately bear right and follow the road to Silves train station. About 100 metres before crossing.